Marcel Karperien studied biology at the University of Utrecht in the Netherlands. After a PhD in developmental biology in which he studied the molecular mechanisms underlying skeletal development, he worked 12 years at the Leiden University Medical Center on various aspects of endochondral ossification. In 2007 he moved to the University of Twente, to combine developmental biology of the skeleton with technology to improve strategies for cartilage regeneration. In 2012 he founded the department of Developmental BioEngineering (DBE) and became a full professor. The Department of Developmental BioEngineering (www.utwente.nl/tnw/dbe) is part of the MIRA institute for Biomedical Technology and Technical Medicine, which is ranked as the 7th best bioengineering institute worldwide. Currently the DBE group comprises 14 PhD students. Research focuses on i) developing injectable hydrogels for cartilage repair, ii) elucidating molecular mechanism underlying chondrocyte homeostasis, iii) improving cartilage formation, iv) the role of stem cells in cartilage regeneration, and v) exploring novel technologies for improved cartilage repair strategies. 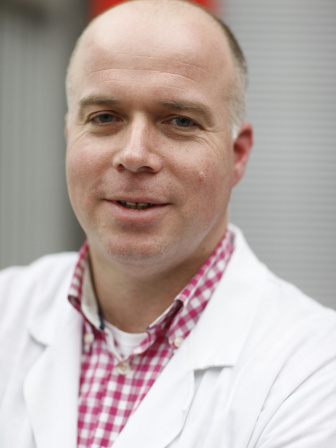 Prof. dr. Karperien is PI and participant in (inter)national projects focusing on cartilage repair including the Biomedical Materials Program, the Smartmix TeRM program, the National Initiative for Regenerative Medicine and projects funded by the Dutch Arthritis Association. More recently he started a 4mEuro National program fighting osteoarthritis by uniting 7 leading Dutch Academic groups in osteoarthritis research with 12 industrial partners co funded by the Dutch Arthritis Association and the Dutch government.